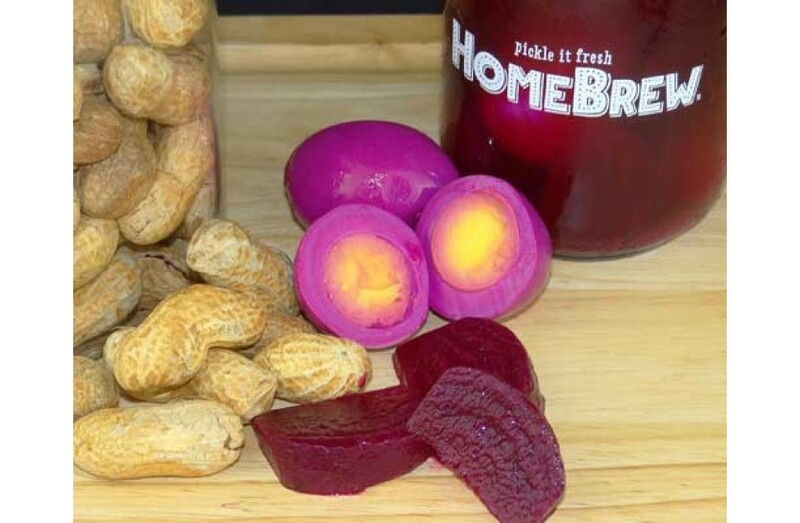 Pickled Beet Eggs - 24-hours in the fridge is all it takes! » Grate Beet. GREAT Pickled Eggs! Grate Beet. GREAT Pickled Eggs! Okay, so the texture is a little curious at first. Actually, so is the taste. But once you're hooked, you're hooked. This week, I concocted two types of pickled eggs based solely on color - Beet (bright pink) and Mustard (bright yellow). For pink pickled eggs, go to the store and buy a beet and a six-pack of hard boiled eggs (of course, you can hard boil your own, but I've recently discovered the convenience of pre-packaged organic eggs in the service deli). Grate the beet - that's right - grate! You're primarily after the color, so you want as much red surface area exposed as possible. Create a layer of beets on the bottom of the canning jar, and nestle (cram?) the eggs on top of that. Prepare your HomeBrew Tangy Beet Quick Pickle Mix according to the directions, and pour right on top of the eggs and beets. Put the jar in the fridge, and wait 24-hours! That's it. One extra thing: I recommend shaking the jar a couple of times (or whenever you think about it). That keeps the color of the liquid even and the surface of the eggs consistent reddish / pinkish. The color will vary according to how many beets you're able to cram in the jar. So, if you want to recreate Joe Jost's, take a bite of egg, a bite of liverwurst sandwich, a swig of Guiness - repeat! If you're thinking about Philippe's, smear a little hot mustard on your egg, bite, and wash down with cabernet and an ice water chaser. The HomeBrew Tangy Beet Quick Pickle Mix is made with sugar that combines with vinegar and the earthy flavor of the beet to provide a rich taste profile unlike anything I've previously experienced. One bite and you'll come back for more. Enjoy.